Being an adventurer requires not just a bag full of supplies and eyes on the horizon, it requires all sorts of survival skills – how to deal with wildlife and bandits, how to build a campfire and shelter, what food can nature offer if you’re running low on supplies, what herbs can you gather in your area and so on. Crimson Adventurers will help to achieve that by creating a community of people who will gather together after their adventures, share their tales, maps, and knowledge they have gained while exploring new lands. While travels can take you far, and as the guild grows we plan to have several outposts located around Elyria, Crimson Adventurers’ Guild will be based in Demalion Empire where we will try to establish strong presence with many outposts and guild halls allowing adventurers to travel around the Empire and beyond with needed preparation, knowledge and supply. Crimson Adventurers are open to discuss potential alliances and cooperation with other guilds, domains or individuals both within and outside the empire. Here are examples of some activities that member of a guild can find himself doing. Either by grouping up with fellow member and heading out on your own or by joining one that has been sanctioned by guild, members can find themselves exploring distant lands, newly discovered ruins, or trying to find that one drunkard who got lost in forbidden forest. Different expeditions may offer different risks, but as such rewards will be greater, and guild will try its best to supply members accordingly before delving into unknown. If your interest lies in creating maps, guild will aim to provide both workplace to create maps in cozy environment, friendly groups that you can tag along with to find new areas and make either more detailed or completely new maps, as well as market for maps you create, since adventurers are primary customers that might need a skilled cartographer, and guild contacts or shops will gladly help you find customers and turn your skills into coin much faster. In case you don’t feel like traveling for some time, you can always spend time in guild workshop to make additional copies of the maps you made or are available to the guild. Those who have a keen eye and light on their feet, may find themselves scouting different areas. You may be asked to find new ore deposits, track down heards, or gather some herbs on your travels. In addition, while guild does not support military actions, observing threats from a distance does no harm, as such, if you desire you may find yourself temporary working with local military, keeping an eye on trespassers or scouting out enemies. Knowing lay of the lands and being able to survive in the wilds, as well as defend yourself, may make you a valuable pathfinder and guide. Those who lack such skills may find themselves needing your help to help them navigate dangerous or unknown for them areas. With others exploring dangerous areas or having good knowledge about surrounding and distant areas, you may find yourself working along others even if you’re not aiming to be an adventurer. As a herbalist, you will know where to find materials you need, or you can request members to grab them for you next time they head out, in return, such adventurers may always be interested in medicine you offer them for their expeditions. As a hunter, you will know where animals you were looking for currently located, and you can always switch between hunting alone, with others, or simply lending your skills with bow during unrelated adventure. This is of course not everything that you may enjoy doing, there are many other activities that you may find yourself doing while part of the guild. Regardless of what you end up doing, our main goal is that you have fun doing it and enjoy playing the game with a friendly community. Guild will try to balance work and activities done by its members, we both want to offer as much freedom to our members as we can, as well as, we want to help our members to find work easier if they are looking for it. Members are always free to choose where to travel and what to do next. Guild does not require its members to focus only on exploration. Guild supports wide range of survival and scribe related professions. There are also no obligatory skills that a member must have in order to join, instead people will choose their own path of how they want to play the game and what skills are more important to a player during his adventures. That’s why a difference in skills will allow a larger pool of knowledge in the fields of surviving and exploring to be shared, making members more prepared. Members are not required to share everything freely and unless it was discussed in advance, guild will never claim possession of items acquired by guild member. A member reserves the right to do with items or knowledge gathered by him, as he deems fit - whether keeping it to himself or trading/selling it. Respect your guildmates when dealing with them, offer best deals when trading but also keep in mind the fact that their work should not go unpaid and their supplies cost money. Guild Halls will be acting as a community hub for its members to gather, where guild leadership can provide members with additional work, acting as a middleman between citizens and members, ensuring both parties satisfied with work and there are no issues in communication. Members will have to pay for their own gear and supplies, that said, when undertaking major expeditions, either that were requested by outside parties, or that will have great benefit to Guild or Kingdom, members can expect support from the guild, either by providing better gear, more support or any other way that will ensure success of the task at hand. Crimson Adventurers is not a military force, however members will not be discouraged to gain combat training, to better survive in the wilds or in case of self-defence. Members of Crimson Adventurers are not allowed to participate in any hostile activities acting as aggressor, as well as taking part of any deviant activities or being part of any deviant groups. Most of the members will be equal among each other, trying to keep minimal ranks and leadership within the guild. Guild ranks are: Crimson Leader, Crimson Overseer, Supervisor, Wing Leader and a Member. The Crimson Leader is the guild leader and its creator. Only he has the authority to appoint Crimson Overseers. Crimson Overseer is the co-leader of the guild. Overseers are usually assigned and work within the borders of one duchy, or in charge of the specific field within the guild. Crimson Leader and Crimson Overseers form Guild Leadership. Supervisor will be assigned to a single outpost or guild hall if needed. Supervisors help with managing guild halls, collecting taxes, and helping guild members in their area to some extent. Wing Leader is the leader of a Wing (see below for more information). Wing Leaders have no authority over members, and cannot recruit/kick a member. Member is a standard rank for most guild members, as mentioned before, members are equal between each other no matter what’s their focus. Members are free to create their own groups within the guild called Wings. Wings are formed when several members wish to work together regardless if they all pursue same goal (wing of scribes) or they just go on adventures together. Members should decide between themselves who will be appointed Wing Leader, and inform leadership to make it official. In addition, willing members can ask for a permission to first start a wing, and then recruit members who are willing to join within the guild. A member is limited to 2 Wings. Wing Leader cannot join or lead any additional Wings. Creating Wings does not put them above other members, but it allows for easier cooperation between wing leader and leadership, thus allowing for more favorable deals with the wing, providing discounts, additional supplies or contacting them for additional paid work if proven necessary. It is only fair to distinguish capable members for their work done or loyalty to the guild, as such members will be assigned Tiers. Tiers can be earned and dropped based on player actions, activity and reliability. Tiers will mostly be used by Leadership and Supervisors to determine if a member is capable to complete official job or go on official expedition. Tiers should not hinder adventurers ability to find work outside guild hall or limit access to any guild facilities. No matter the tier, all members still viewed equally, as such tiers do not give the right for high-tiered members to command low-tiered ones. If you would like to join, have any questions or just want to chat, join our discord HERE. The Guild Hall in Drifgard is planned to be built in the form of a longhouse and will act as an HQ for the Crimson Adventurers. The Guild Hall will have rooms for rest and enough space for people to gather and trade. You will be able to rent some rooms for a prolonged duration for a small fee or given to experienced/dedicated members for free. Íngíshorn Guild Hall, while smaller than the HQ in Drifgard, offers no less excitement. Depending on Domain Selection it will either be located in the alpine forests, or a mountainous area. Crimson Adventurers in these parts will have many opportunities to chart the wilds, be sent on various missions with a low chance of survival, and much more. Will you chart the dangerous mountain passes and explore the forests where who-knows-what is lurking? Will you claim your fame among the adventurers of the land? You can do just that at the Íngíshorn Guild Hall. Mistvale Guild Hall will be located in close proximity to the Scouts Quiver, the town’s main inn that is also an Elyrian Initiative chapter house, meaning experienced adventurers in Mistvale will have a direct path to contracts issued by nobles and other affluent members of Selene. Guild Hall will contain lodging for Crimson members, a resident Crimson guild supervisor and a large meeting space for members. The guild will also have a private room for members use at The Quiver. If you like to join any of the Guild Halls or Outposts, please join our discord. Smygarna Wing will focus on hunting and occasional monster hunting as well as selling and crafting out of materials acquired during the hunts. Wing will focus on gathering knowledge about things related with "magic". expeditions into ruins, far away places, looking for relics and people with talents and so on. Later in the game wing will also focus on making preparations toward travels to other continents. If you like to join any of the existing wings, please join our discord and contact wing leader. It is pleasant to me! Recruitment continues, we're also open to any settlements willing to work close with guild for mutual benefit. Guild is looking for any cities, inns, organizations or private businesses that are willing to cooperate with the guild. Whether you're in Demalion or in another kingdom but willing to work together for mutual benefit, stop by our discord and give me a poke. 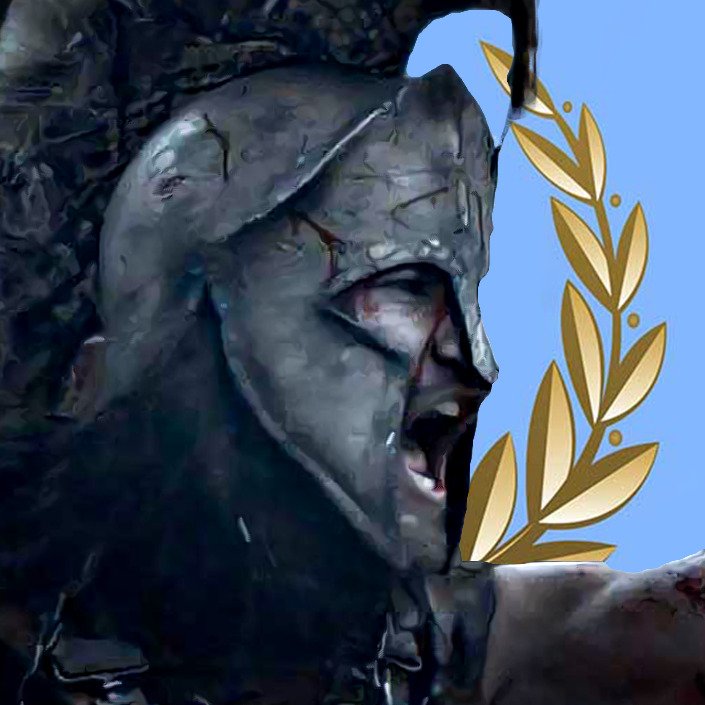 -Expanded on guild structure, taxation and leadership. It has been a while, but we are still active and recruiting + made a small changes to a post. And once again, have a nice holidays! Smygarna Wing, led by Tosolo. Wing will focus on hunting, occasional monster hunting as well as selling and crafting out of materials acquired during the hunts. If you are a hunter, ranger or even interested in leatherworking, stop by our discord and have a talk with the leader. 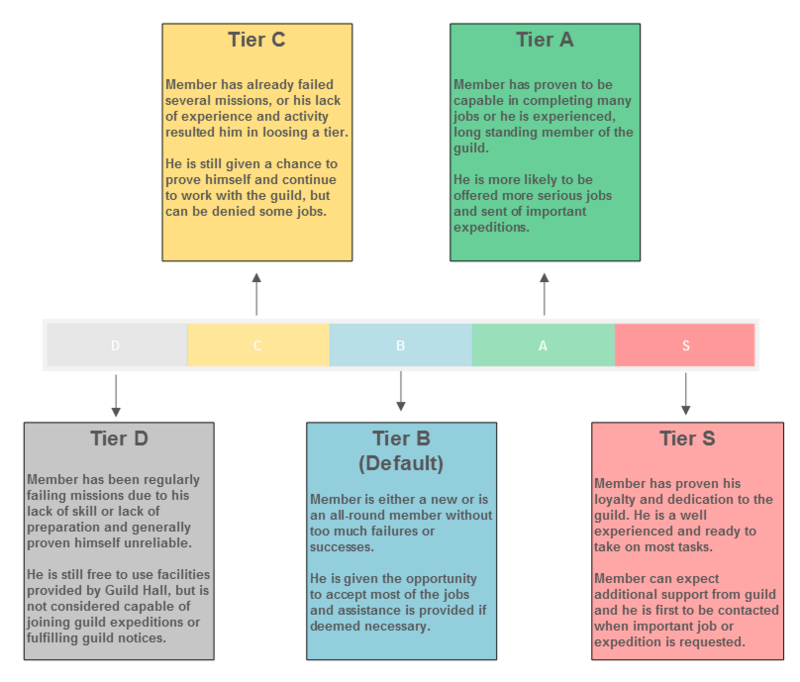 Updated the post to better reflect our goals, added information regarding Tiers. Looks great mate, loved to read through all that stuff :) and I must admit I have found some similarities in your Tier Sytem in some great Animes, nice work.